Airports are cashing in on the queues at their security gates by charging passengers to use fast-track priority lanes. At least eight have introduced the system and are charging travellers up to £5 to beat the queues. A whistleblower security guard at Luton Airport, which adopted the system last year, claimed there is a deliberate policy to let the queues grow to encourage people to pay for the express lane. The claim was made as travellers were warned to expect more stringent checks in the wake of the cargo plane terror plot emanating from Yemen. With the checks involving the removal of shoes and belts, body scans and patdown searches, the process is so time-consuming that passengers are arriving at airports up to three hours before departure to make sure they catch their flights. Luton introduced a fee of £3 in March last year, allowing travellers to skip the queue by using a ‘priority lane’ to reach the security checkpoint. Bristol and Aberdeen have £5 charges. Leeds Bradford, East Midlands, Liverpool John Lennon and Newcastle have £3 charges. Manchester has a fast-track security lane for travellers who book expensive VIP Valet parking. The claim was denied by Luton Airport. The Air Transport Users Council, the official consumer body for passengers, described the claims as ‘worrying’. Its chief executive, Simon Evans, said the ATUC was monitoring the situation. 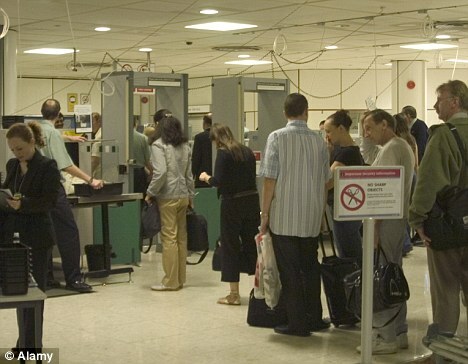 He added: ‘Going through security is not a service, not a perk, it is something that people have to do. Earlier this week, Ryanair boss Michael O’Leary joined other airport industry leaders in condemning the current level of security screening. He said: ‘What happens, particularly in the coverage of the Yemeni issues of recent days, is that we have another huge lurch by the securicrats into making travel an even more tedious ordeal for the travelling public. However, Mr Evans said budget airlines have put such pressure on airports to cut landing fees that the owners have had little option but to introduce new passenger charges. He added: ‘The reality is that this is revenue raising. Mr Evans said it might be possible to establish league tables showing which airports have the longest queues, to give them an incentive to improve. A spokesman for Luton Airport said it had ‘definitely not’ allowed security queues to grow in order to encourage people to pay for the priority lane. He added: ‘The introduction of a priority lane does not impact overall waiting times. Data we have collected since the opening has clearly shown this.